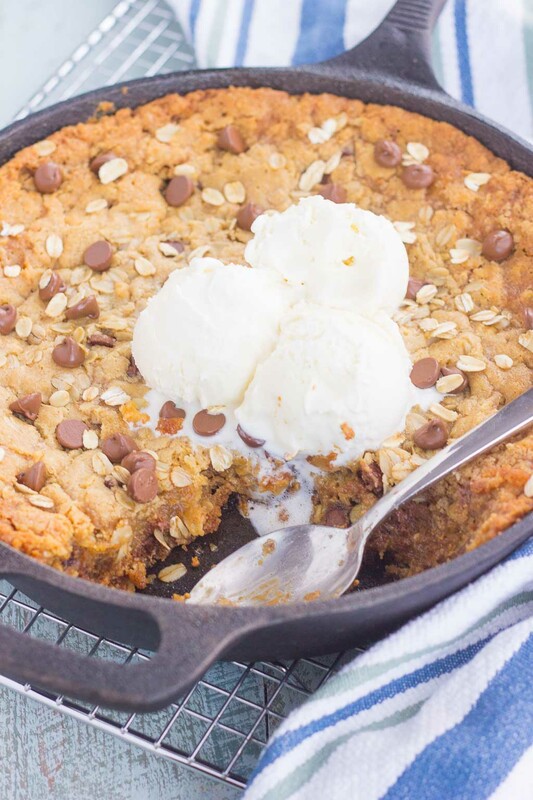 You won’t be able to resist this warm, thick, and fudgy Peanut Butter Chocolate Chip Skillet Cookie. Packed with creamy peanut butter, hearty oats, and chocolate chips, this cookie is packed with flavor and is perfect when served with a big scoop of vanilla ice cream! Have I mentioned before how life changing cookie skillets can be? Ok, maybe life-changing is a taking it a little too far. But, dessert changing, now that sound better. The first time I made my own skillet cookie (remember this Chocolate Fudge Skillet Cookie?) I was hooked. Hooked! I mean, I’ve had them before in restaurants, but have never made my own before. And since that time, it’s been a dessert that I dream of often. 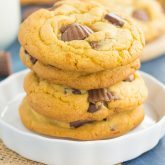 So, since it’s cold, snowy and just blah around here these days, I thought a thick and fudgy, chewy, yet soft, peanut buttery, chocolatey giant cookie, made in a skillet, would be much needed for February. Agreed? I’ve been wanting to try this recipe for months, ever since I came across it in Cast Iron, Comfort Food Magazine. Remember that I’m a magazine hoarder? Ok, hoarder is a strong word, but I do love food magazines and always find inspiration. And since I’m in need of some cozy desserts, I thought this would be the perfect recipe to share. You know what I love best about skillet cookies? They’re so easy to share, or not share, your preference! The hubster and I grabbed our spoons, some vanilla ice cream, and dug right in. No plates or bowls needed! 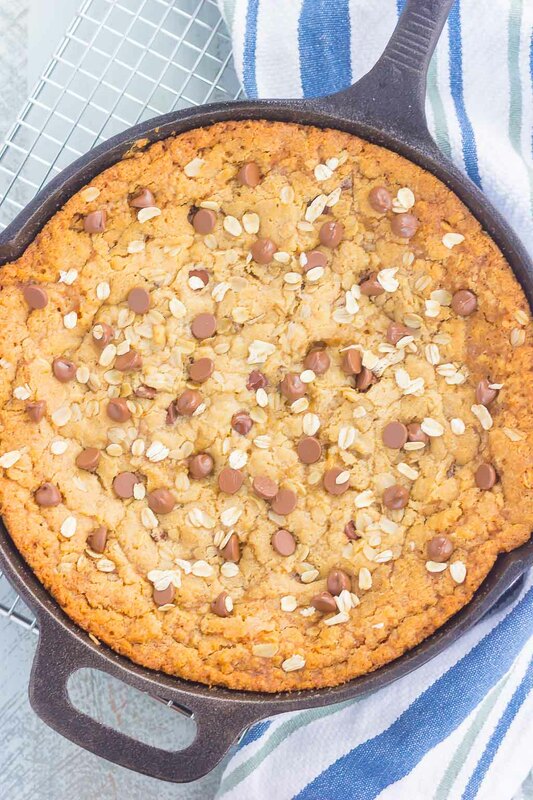 But really, friends…a cookie baked right in a skillet. It’s just like a pie, but in cookie form! Thick, soft, chewy, and full of flavor. Now how about that for this cold and dreary day? 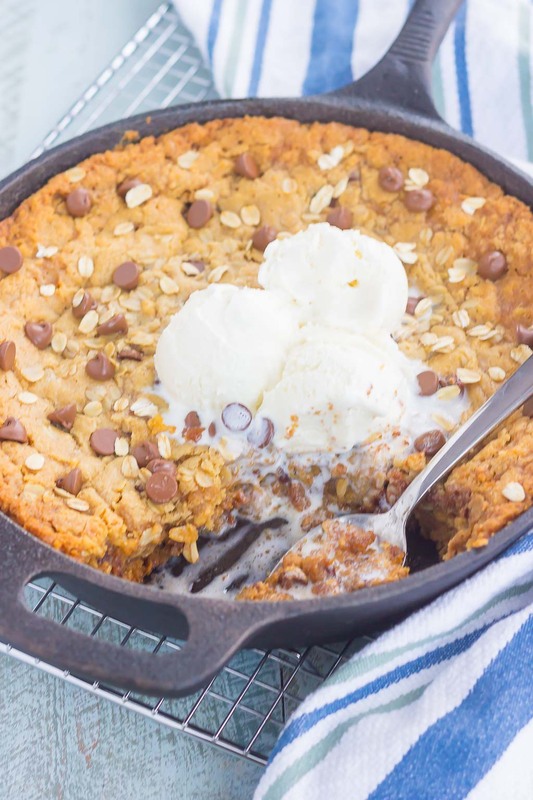 And like most of my recipes, this Peanut Butter Chocolate Chip Skillet Cookie is so easy to make! But, you knew that was coming! My favorite part of the prep process is spreading the peanut butter and then topping it with loads of chocolate. Mmm mmm good! And just wait until this is baking in your oven…your whole house will smell oh-so wonderfully delicious! 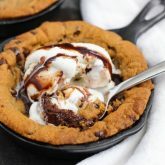 So grab those ingredients and whip up these easy and oh-so decadent Peanut Butter Chocolate Chip Skillet Cookie. Your tastebuds will thank you! 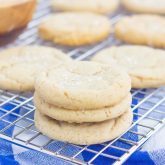 Looking for more cookie recipes? I’ve got you covered! 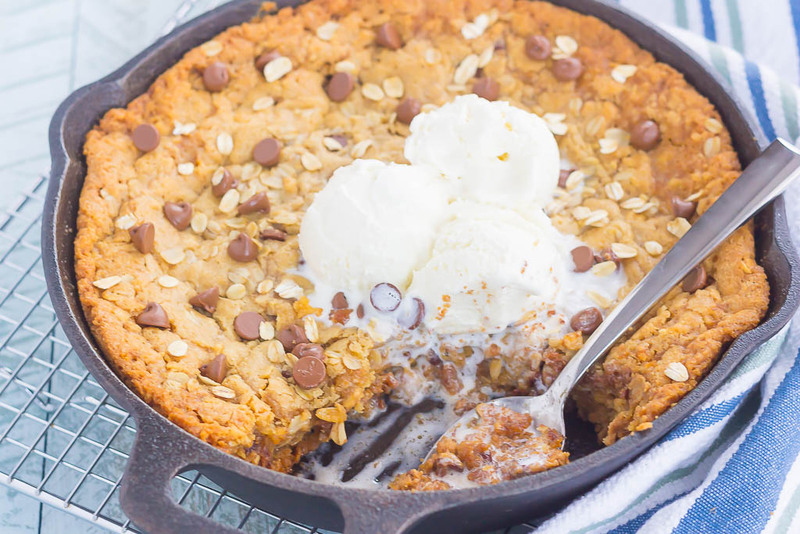 You won't be able to resist this warm, thick, and fudgy Peanut Butter Chocolate Chip Skillet Cookie. 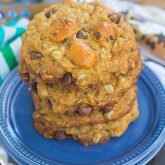 Packed with creamy peanut butter, hearty oats, and chocolate chips, this cookie is packed with flavor and is perfect when served with a big scoop of vanilla ice cream! Preheat oven to 325F. Lightly grease a 10-inch cast iron skillet with non-stick cooking spray. Set aside. In a large bowl, cream butter and brown sugar with an electric hand mixer or stand mixer with fitted paddle attached until smooth and fluffy, about 3-4 minutes. Add egg and vanilla. Beat until combined. In a small bowl, whisk flower, baking powder, and salt. Gradually add flour mixture to butter mixture, beating until just combined. Beat in 3/4 cup oats and milk. With dampened hands, spread half of dough mixture onto bottom of prepared skillet. Spread peanut butter onto dough, followed by chocolate chips. Drop heaping spoonfuls of remaining dough over peanut butter mixture. Sprinkle with remaining 1/2 cups oat and more chocolate chips, if desired. Bake until center is slightly firm and cookie is golden brown, about 45-50 minutes. Cover loosely with foil the last 10 minutes of baking to prevent excess browning, if desired. Let cool for 15 minutes, then serve with vanilla ice cream, if desired. Skillet cookies are life changing...they're one of my biggest weaknesses! These flavors are EVERYTHING and I wouldn't be able to resist this! Oh my gosh. Drooling. That warm, thick cookie with the melty ice cream!!! I've always wanted to make a skillet cookie! This looks amazing! Love that you added oats to it!